Crivvens! 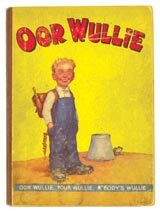 Now Oor Wullie Book 1 sells for £3,630! 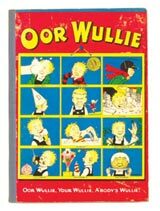 Our November catalogue was a complete sell-out and these rare first six issues, starting in 1941 and printed biennially with The Broons Books by D C Thomson had a lower print run than their Beano and Dandy counterparts, only being distributed in Scotland. 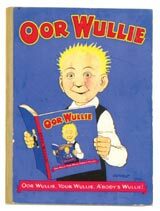 Oor Wullie book 2 realised £1936, and books 3-6 averaged between £660 - £880 each. 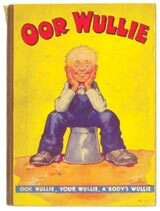 This 1939 Dudley D Watkins classic artwork was the earliest ever offered at auction, when the Wee Lad was barely three years into his uproarious adventures and it is not known to be reprinted in any of the Oor Wullie books, Coming straight from the Sunday Post’s Fun Section, which started in 1936. It was therefore no surprise when the piece sold for £1945, one and a half times its upper estimate. 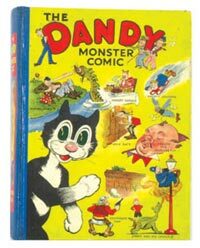 Those hardy perennials, Beano and Dandy continue to prosper, with a slightly restored copy of the first Dandy Monster Comic from 1939 making £2.915. 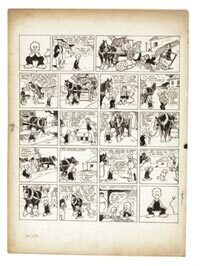 Complete years of the comics also continue to attract strong bidding with a Beano complete year from 1954 finding £643, or just over £12 a copy. 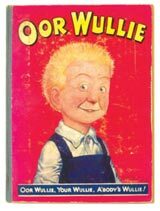 Dandy is never far behind, but complete years tend to get three quarters of Beano prices. 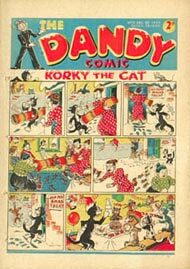 A single issue of the first Christmas Dandy comic, No 4, made £474 in VG- condition, whilst a Beano comic No 4, one grade higher realised £968. 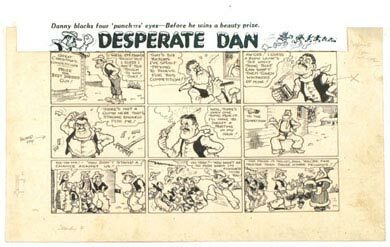 Desperate Dan made sure he was the best lookin’ dude in Cactusville by outsmarting his fellow contestants for first prize Xmas pud and turkey and this early piece from Dandy Xmas comic 4 made a blow-torching £825! Our artwork sales continue to flourish and three Dan Dare artworks from the pop-up book of 1953 were chased to £485, £829 and £520 respectively. These action-packed pieces were drawn and painted by Desmond Walduck and the Frank Hampson studio artists. 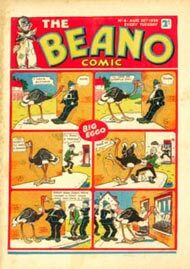 The 1960s Beano and Dandy comics have a wide collector base and bidding for complete early years of this decade averages £4-6 per copy in Fine/Very Fine grades. 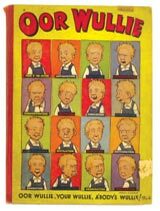 Topper and Beezer from the same era are more generally found in lesser condition and often with horizontal folds due to their large format with successful bids reaching half to two thirds of these prices. Our US section featured the athletic Rulah in All Top #10 and 12 fetching £150 per copy and Batman #64 at just-above-guide £88. A VG cents copy of Amazing Spider-Man #3 went £50 over guide to £278 possibly due in some part to the fact that Doctor Octopus will be Spidey’s eight-limbed adversary in his new movie being premiered later this year. Silver Age keys that are pence stamped copies in mid to high grades still offer great value in our catalogues, often selling for as little as half the price of their cents counterparts. A VG+ pence copy of Tales To Astonish #27 with no major defects illustrated this point by selling for £220 against a cents book value of £330, a two thirds discount price that should appreciate in the near future. Over the last two years we have strengthened our policy of offering individual issues of Marvel and DC comics in high grades with relatively low values. This has been met by a stronger and stronger customer response in bidding as items successfully sell in the area of £8 - 20 each. This policy came about from a survey we did asking customers what they would like to see in our auctions as we developed. In the same way, if there is any way that you feel that we could improve our services to you we would like to hear from you. All good wishes for 2004.